What do you think about weather modification as a possibility? it only worked with clouds that were in the right state--ready to rain--so how to know if it would have happened anyway? are the forces involved in weather too large for humans to modify? what are the biases of the experts? if we could turn the whole earth into a garden modified for our own benefit, should we? what does this say about how we think about our relationship with nature? 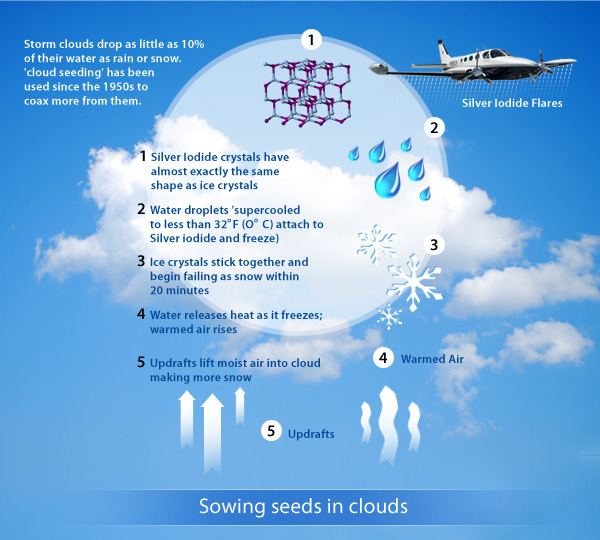 in a larger scale in some other countries: "There’s even a luxury cloud-seeding market emerging—one European company, for instance, charges a minimum of $150,000 to guarantee good wedding weather by forcing clouds to rain in the days before the event."